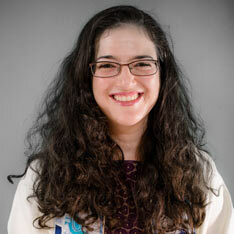 Shira Freidlin received her Bachelor of Fine Arts in Film and TV from New York University’s Tisch School of the Arts. She holds a Master of Arts in Jewish Education from the Davidson School of Education at the Jewish Theological Seminary of America. Shira began her career in Jewish education at her home shul, B’nai Israel of Rumson, New Jersey, where, as a child, she gained inspiration from her studies of Jewish values and traditions. Shira has enjoyed serving at Jewish camps, Hebrew schools and community centers, as well as the Spiritual Department at Cedars-Sinai Medical Center where she currently serves as a Chaplain Intern. At Beit T’Shuvah, a Jewish residential alcohol and drug treatment facility where Shira served for five years, she found true joy in Torah and community. After ordination, Shira looks forward to sharing her love of Judaism in myriad ways: from the bimah, through teaching, spiritual counseling, officiating at life-cycle events, and organizing spirited Purim shpie/s!